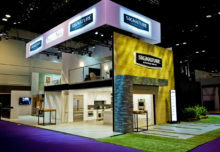 Large-scale trade shows, b-to-b conferences and trade show exhibitors have gotten a bad reputation over the years for producing too much waste and having too little regard for their impact on the environment. But over the last decade or so, the organizers and exhibitors at the annual Consumer Electronics Show (North America’s largest trade show and the world’s largest show for consumer technology) have been making strides to offset their carbon footprints as much as possible. For the last couple of years, CES has partnered with the green organization Repurpose America, which after each event collects the show’s vinyl and magnetic banners and repurposes them for use at Las Vegas community groups. 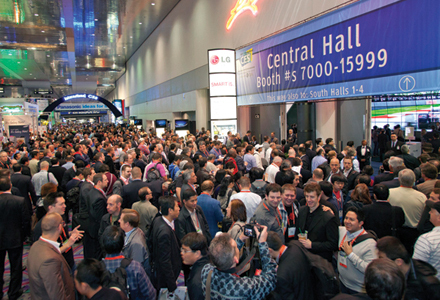 At this year’s show in January, CES produced the badge holders for more than 150,000 attendees out of repurposed vinyl banners. “We tried to collect a good number of those badge holders again this year, so we could give them a third life in the community,” says Lutz. This year the show captured more than 63,000 square feet of vinyl and magnetic banners, and more than 16,000 square feet of other show signs and materials that will either be badge holders again next year or reused locally. Last year CES also donated $75,000 to the Las Vegas Metro, which purchased seven electric police motorcycles still circulating today. This year, it’s donating $50,000 to Green Chips, a local group that’s installing solar panels at the Las Vegas rescue mission, and $25,000 to Repurpose America to take the vinyl banners that hang on the side of the Renaissance and Marriott hotels and turn them into sun shades for local community groups, which face sun and heat for nearly 300 days out of the year. The show has been making an effort to cut print production by more than half through electronic and online communications. However, because it still has to produce guides and exhibitors still pass out their industry publications, this year they went around after the show to collect leftover show guides, directories and industry publications. They collected more than 50,000 pounds of materials. CES helps its exhibitors make a difference by offering them turnkey Green Booth packages made from more eco-friendly materials like recyclable carpet, back and sidewall panels made from biodegradable materials and graphics using a soy-based ink (Global Experience Specialists (GES), Las Vegas, handles). CES also creates tech zones, like the Sustainable Planet TechZone, or GoElectricDrive TechZone that groups companies with similar products, including renewable energies products, to give them a chance to participate in the show before they grow into their own space. New this year was an area called Eureka Park where companies with emerging technologies could showcase their products.